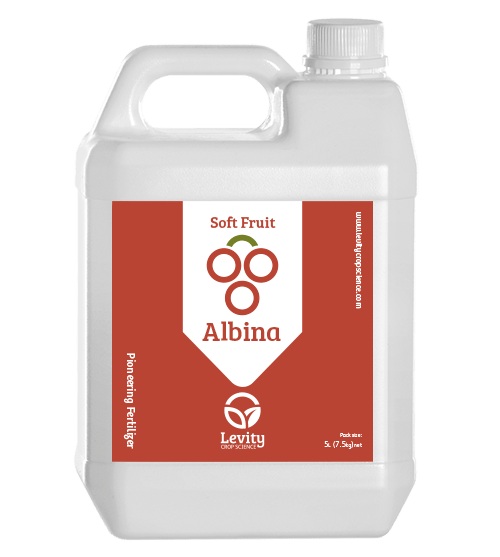 Albina for Soft Fruit, is a pioneering new product that improves fruit firmness and shelf-life. Albina works by helping soft fruit absorb calcium, a nutrient that can improve firmness and quality but is poorly absorbed by maturing soft fruit. Albina uses Levity’s pioneering chemistry, to stimulate calcium absorption into ripening fruit, where conventional products cannot. it will help soft fruit producers get firmness, fruit set, shelf-life to higher standards using very low inputs. Albina helps soft fruit absorb calcium. Most growers know that calcium Is important for soft fruit, as It can Improve cell wall strength, which has a positive effect on shelf life, ﬁrmness and ability to withstand diseases. This is where Albina, the most advanced fruit ﬁrmness product ever developed, comes In. Albina uses Levity’s pioneering chemistry to stimulate calcium absorption into ripening fruit, where conventional products cannot. This helps growers achieve ﬁrmness, fruit set and shelf life to higherstandards using very low inputs. Albina has a very distinct orange colour, which comes from natural stimulants that protect cell walls. This Is a major advance In ﬁrmness, as we can protect cell walls at the same time as strengthening them with calcium. Levity’s aim when we set out to develop a product is to ﬁrst understand what the farmer needs, then understand the crop, and ﬁnally adapt our science Into an easy- to-use product that delivers results for growers. When growers use Albina, they will see good improvements over conventional products. Application Rate: 1 l/ha foliar spray at 14 day intervals.